The design browser is where you can browse and select the design that you want to work on. When you create a new design, by selecting New Design from the menu, a new thumbnail will be added to the browser. 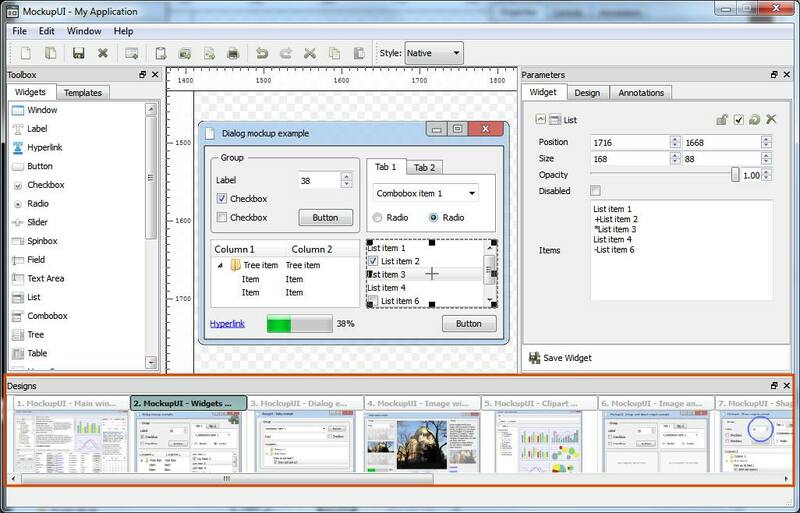 The designs in a project are displayed as a horizontal list which can be navigated by dragging the bottom scroll bar from left to right. When you click on a design thumbnail from the list, MockupUI will make that design the current selection. The thumbnail will be highlighted and the design area and parameters panel will be updated. Cut Ctrl+X: Remove the design from the project and put it onto the clipboard. Copy Ctrl+C: Put a copy of the design onto the clipboard. The copy will preserve all the parameter values of the original. Paste (Ctrl+V): Pastes the design found on the clipboard after the currently selected one. Duplicate Ctrl+D: Creates a copy of the design and inserts it after the currently selected one. Clone Ctrl+L: Creates a clone of the current design and inserts it after the currently selected one. Rename F2: Changes the title of the design. Delete Del: Removes a design from the project.